If you've been around since last Christmas you'll know how much I love glitter houses. If your newer to Happy At Home let me introduce you to my Christmas Time Obsession . . . Glitter Houses! I have quite the collection of houses I've made myself and a few that I have purchased. Personally I love the ones I make more than the others. I find such joy in cutting, painting and glittering them that I don't think I'll ever give it up. Here are a few that I made for Christmas last year. . .
My glitter house creations are humble in comparison to examples I find elsewhere, but that's OK, the joy is in the crafting and displaying. I can help you with that! Take a look at few more examples I've found . . . I fear my hubby is dreading the glittering storm to come. Twice already this past week I've had the dinning room table cluttered with some project or another and the look on his face when he groans "OH, NO, it's not glitter house time yet!!!" is priceless. I always remember to respond with a sweet "No, not yet sweetie" - - I'm such a naughty wife. Hopefully this years plans won't take over the house as in years past. You see I'm going to try my hand at miniatures this year. I think they are lovely and hope I have a talent for them also. Here are a few of my favorite examples . . . I hope I have passed on the obsession and a few of you are ready to get your glitter on! p.s. In case your wanting to give it a go, I have a two tutorials to get you started if you'd like... here....and....here. Enjoy! I was just in a putz house swap hosted by Erika of golden Egg Vintage. The houses all came out so cute. I love the as well. I just love your glitter houses. I had to laugh at your husband's reaction after seeing all the supplies on the table and thinking it was glitter house time. Squeeeeal!! I always love it when it's glitter house time at Robin's!!! I'm your biggest glitter house fan! Which is funny because I actually hate glitter in my own house. I wear contact lenses and I have this huge fear of glitter getting in my eye. But I so love looking at your gorgeous houses! Good luck with the miniatures! They are going to be adorable! I'm with Lisa! Glitter house time, baby!! 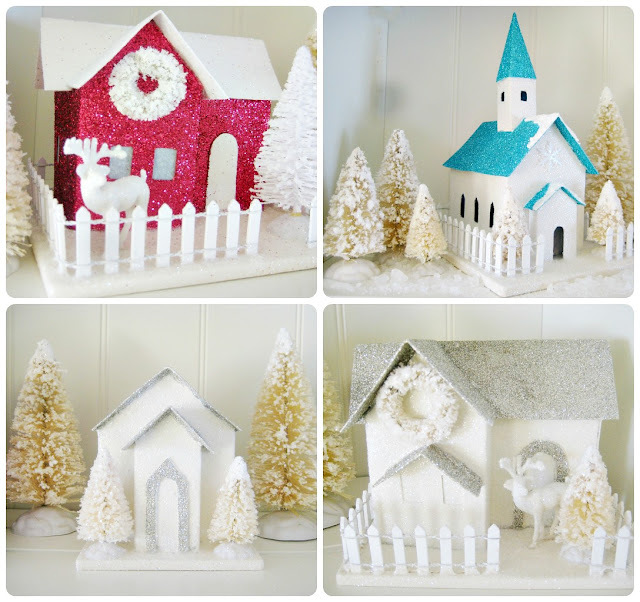 :) I made a few mini houses last year from a BH&G template: http://www.bhg.com/christmas/ornaments/snowy-village-christmas-ornaments/. It was pretty easy once I got the hang of it and made about a dozen for little gifts. Can't wait to see what you come up with! Your glitter houses are truly gorgeous and so are all of the inspirational ones that you showed. It's nice to find something that you honestly enjoy doing, isn't it. And yours are every bit as nice as the others. I love them! You die great!! !